Phoenix USB Pro is a small utility that allows you to flash stock firmware on Allwinner Chipset Devices (including A10, A13, A20, A31 chipsets). Here, on this page we have managed to share the latest and the old version of PhoenixUSB Pro. Phoenix USB Pro allows you to flash stock firmware (original rom) on Allwinner Chipset devices. Simply, launch the Proenix USB Pro tool on your computer, load the key, load the firmware, add the device to the computer (make sure it is poweroff) and click on start to begin flashing. The latest version (v4.0.0) of PhoenixUSB Pro is built with the Debug View Feature. 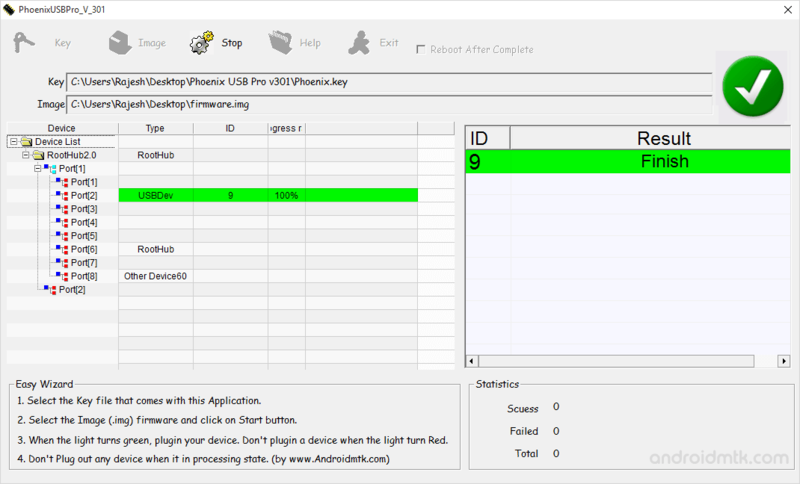 The debug view feature allows you to see the details of every steps on PhoenixUSB pro. Previously PhoenixUSB Pro needs to add Key to use the tool but in the latest version (v4.0.0), you can use the tool without adding the Key in the tool. [*] How to use Phoenix USB Pro: If in case you want to learn to operate Phoenix Pro to flash stock firmware, then head over to the How to use Phoenix USB Pro Page. [*] PhoenixUSB Pro is made to work for Allwinner Chipsets Only (including Allwinner A10, A13, A20, A31 chipsets). And it may not work correctly for other chipsets. [*] Caution: During the system upgrade process your personal data will be lost permanently. So, backup your personal data from your device before flashing or upgrading your device. [*] Alternative Tool: Livesuit, PhoenixSuit, PhoenixCard are the best alternative tool, which also allows you to Flash the Allwinner IMG firmware on the Allwinner Android Device. [*] Credits: Phoenix USB Pro is created an distributed by Allwinner Technology Co. LTD. So, full credits goes to them for sharing the Tool for free.